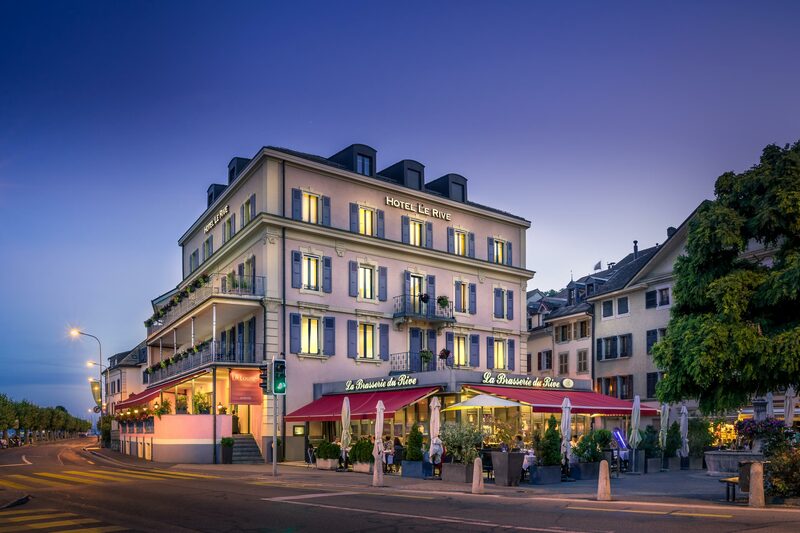 Our hotel, symbolic of the Rive quarter in Nyon, has undergone a full transformation in its location opposite the landing stage, with 29 rooms looking out onto the lake or town. The brasserie and lounge bar are available to customers and the public seven days a week. The hotel is located on the riverside, opposite the landing stage. All the rooms in the hotel are air conditioned and include a flat-screen television, minibar and bathroom which is fitted with either a shower or bathtub, hairdryer, bathrobes and complimentary toiletries. Several rooms have balconies, offering wonderful views out over the lake. A stylish, beautifully lit room with every facility needed to ensure your comfort. A room with soundproofing and air conditioning. The bathroom includes either a shower or bathtub. A soundproofed, air conditioned room with a balcony, giving magnificent views over Lake Geneva and the Alps. The family suite is soundproofed and air conditioned. What’s more, you'll enjoy a large space to relax in. The Executive Suite is soundproofed and air conditioned, and you’ll enjoy a large space for relaxing. We extend our warm invitation to the Brasserie Restaurant Le Rive with its friendly, inviting atmosphere. Here, you'll be able to enjoy a superb view over Lake Geneva and the Alps. Our restaurant offers French and Mediterranean cuisine, with a varied menu using fresh products that change with the seasons.